This statistic shows the ten largest cities in Ukraine in 2016. Around 2.91 million people lived in Kiev in 2016, making it the largest city in Ukraine. 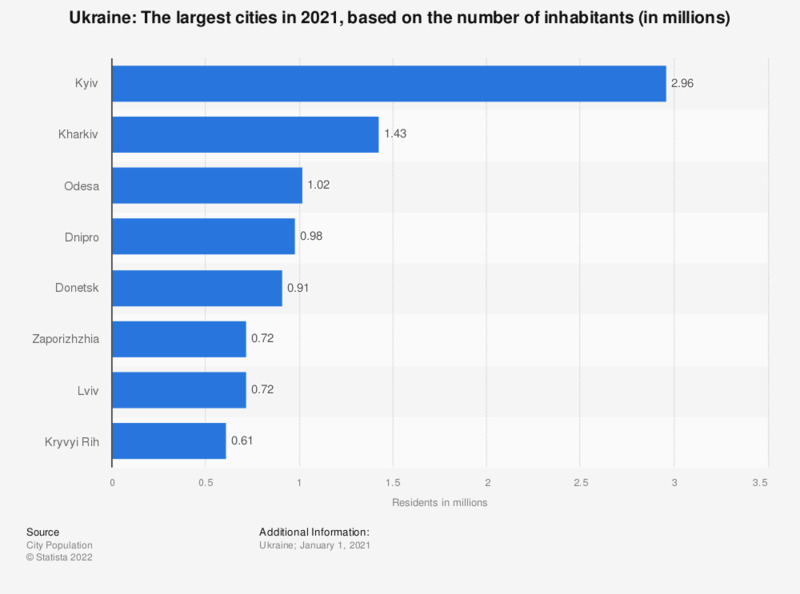 Ukraine has a population of around 42 million inhabitants - close to 70 percent of which live in urban areas, with almost 3 million living in Ukraine’s largest city and capital, Kiev. The city is located in the north central part of the country on the Dnieper River and is one of the largest in Europe. The country’s second largest city, Charkiv, is about half of Kiev's size and located in the northeast. Charkiv was the first city to be occupied by the Soviet Union in 1917 until the collapse of the Soviet Union in 1991. Since the collapse, Ukraine has been largely divided between east and west. Many inhabitants speak Ukrainian to the west, whereas Russian is dominant in parts of the east and south. Like Charkiv, many of Ukraine’s other biggest cities which have less than 1 million inhabitants are located to the east of the country – a region which has uprooted and displaced many its inhabitants because of the war. Not only are rising numbers of Ukrainians still being internally displaced, but Ukrainians across the country are directly affected by a huge spike in inflation which reached near 50 percent in 2015. Unemployment has also risen to more than 11 percent, and the country’s GDP has also been significantly impacted by the chaos. This situation has left many Ukrainians in need of aid, and internal displacement is still rising.